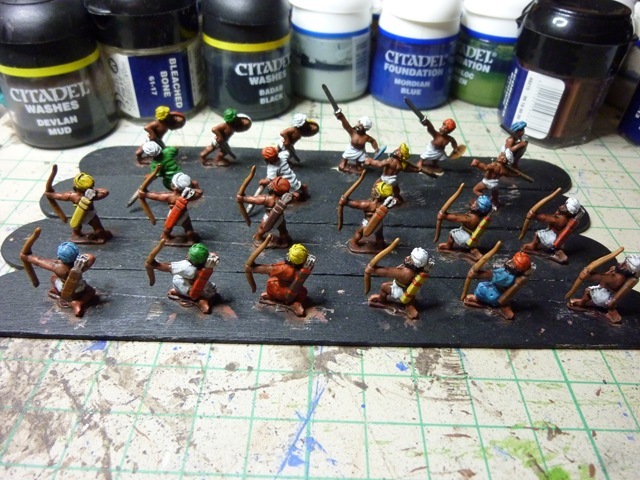 I thought I would do a quick write-up of painting the Rajputs for Cancon 2011. Realistically, it should not be that difficult to paint up a DBA sized army. 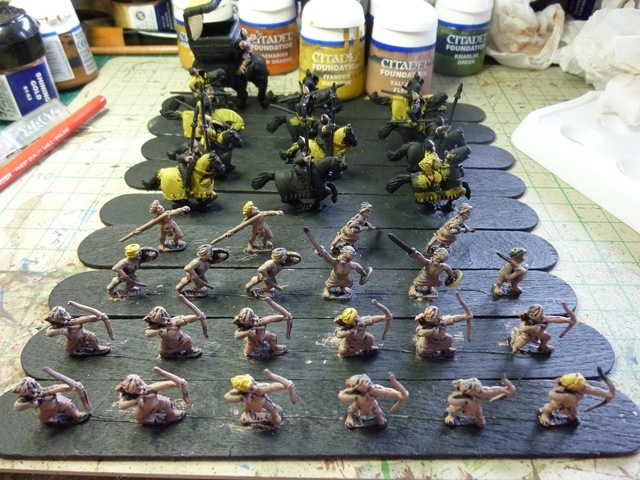 Painting one element a night and over two weeks a DBA army would be completed. 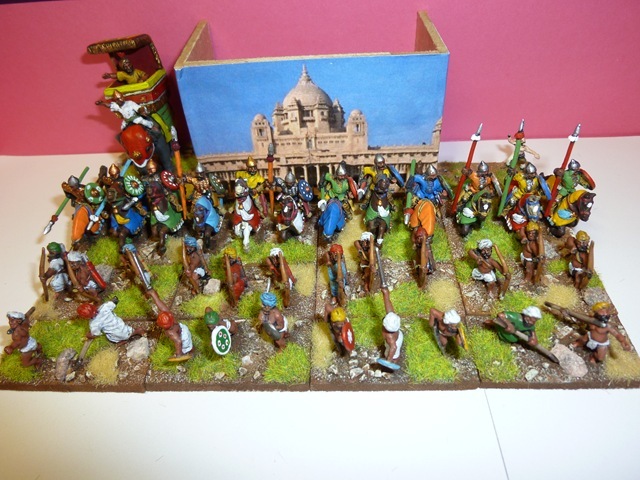 I selected the Rajputs from an Essex Miniatures DBA Army pack that I had. 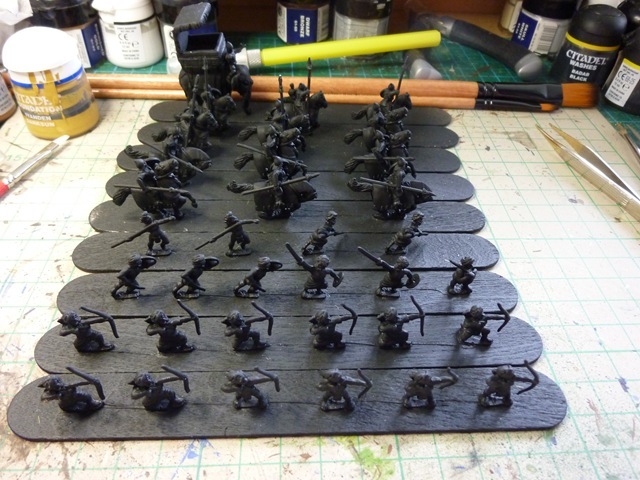 Below are the steps I undertook to painting the army up. The first step was to clean the miniatures up and stick them to some tongue depressors ready for painting. There was not much cleanup on these figures, just a little flash here and there to remove and the odd mould line to file back. Whilst the cavalry and elephant is shown here, I will concentrate this on the infantry only. The same principle was used for the cavalry and elephant in any case. Once the figures have been cleaned and stuck to tongue depressors, they are sprayed with a black undercoat. I used Citadel Black Undercoat for this. 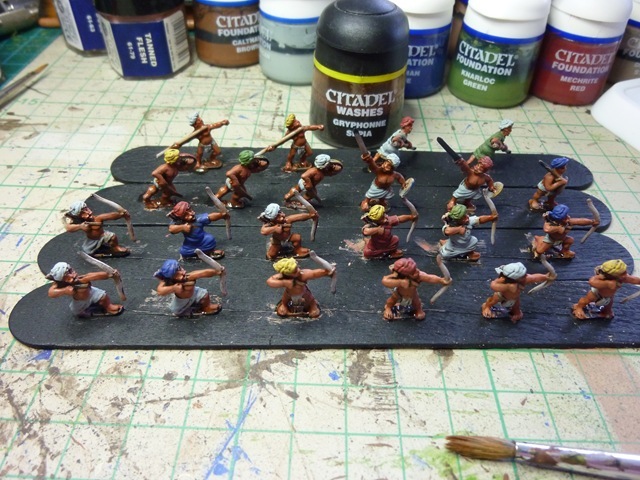 The figures are then given a heavy drybrush (well, more like a wet brush) of white using a large flat brush. The idea is to recover the major part of the figure in white, making the detail easier to see but leave the deeper recesses black as this will later form a nice shadow. 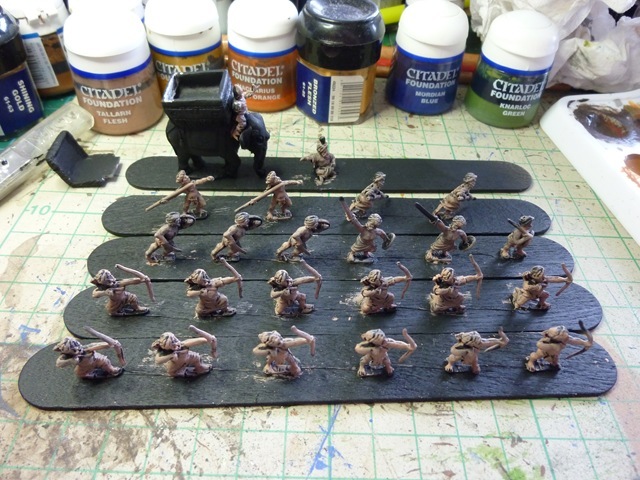 A wash of brown ink is then applied over the figures followed by some base coats. In this case I am showing a base coat for the yellows. This is one of the Citadel foundation colours and provides a base colour that will provide some opacity for the yellow pigmented paints. Foundation colours are on everywhere and the figures are starting to take some life. 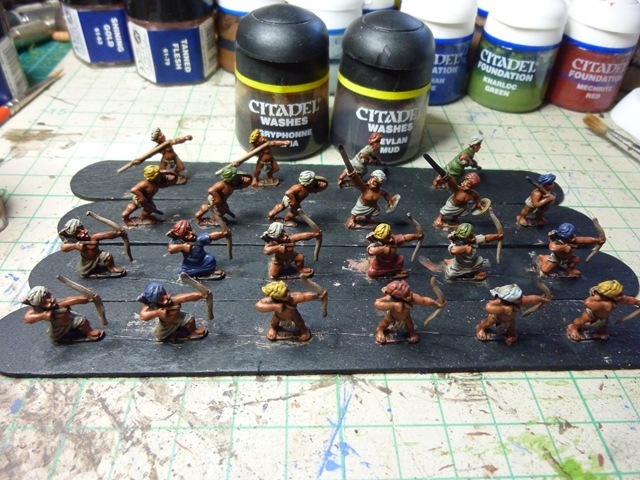 The basic flesh colour is now painted on the figures. I will be darkening this shade later with multiple washes to darken the skin tones. 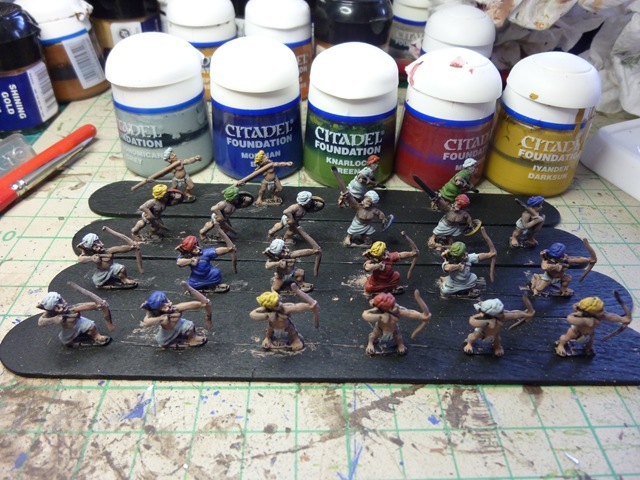 The foundation colours and skin tones are given a wash of Citadel’s Devlan Mud. This is probably my favourite wash colour for figures (as compared to the black wash that I love to use with ships). A final flat brush painting of the top colours (the greens, reds, yellows etc) is now given to place the final colours in place. There is some natural shading that results from this process and it can be seen here. the leather, bows and arrows are also finished off in this step. The figures are, to all intents and purposes, finished. 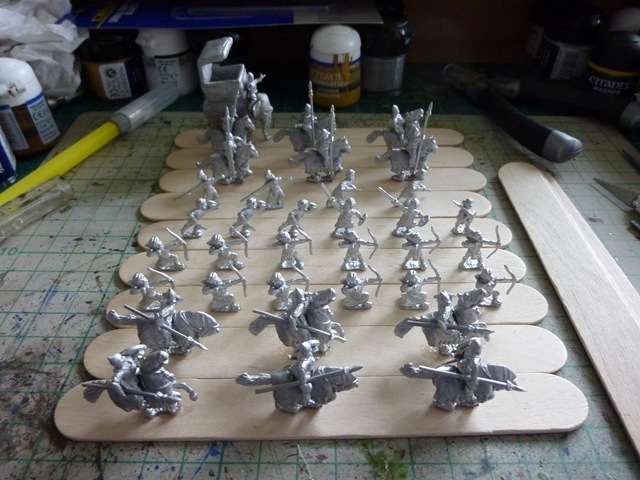 The figures are then attached to MDF bases of the appropriate size ready for the basing process. When I am basing I glue sand to the base first, then wash that with a thinned dark brown, followed by dry-brushing with progressively lighter shades of brown. Flock and other decoration is then added at the end and the whole base and figure spray varnished. The final army ready for travel to Canberra. I added some magnetic strip to the bottom of the bases so that they would stick to the bottom of a metal covered box. The camp was made in a hurry and in this case I used a picture of a Rajisthani palace glued to a base the correct size. 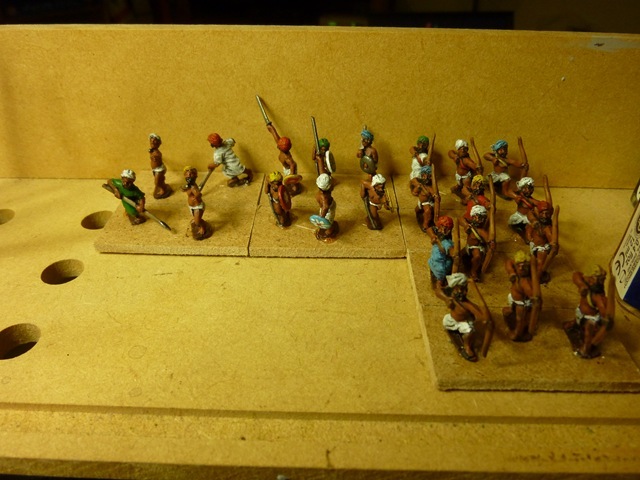 This then was the painting process for the Rajput Army. Next Article Fast Internet in Singapore … StarHub not! A very useful post. This is the first convincing argument for black undercoating with acrylic paints that I've come across. Everybody I know who uses black undercoats either ends up with dull colours or uses the old Humbrol-type enamels which are significantly more opaque than acrylics. Or they put on a bazillion coats of paint. For mine, I'm an optimizing kinda painter – what is the most interesting visual effect that can be achieved with the fewest coats of paint? Using the undercoats to get a highlight/shadow separation is a very interesting idea indeed. I'm just back from Bunnings with some black spray to give it a go. At the moment I'm getting good effects with the opposite approach: put the shading on top with washes. This is the "Army Painter Dip" approach, although there are ways to mix good DIY acrylic washes that are more subtle than that.